Do the Christian women you know lead lives of healthy balance? On March 5, 2016, over 100 Boston-area women (non-profit leaders, mothers, students, businesswomen, pastors and other leaders) gathered to address this question. 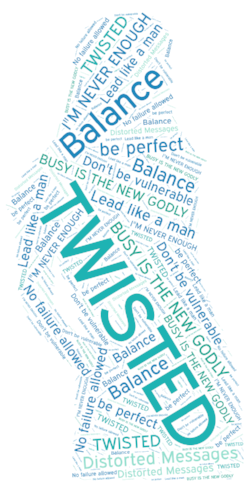 Women of various ethnicities, church affiliations and ages devoted their Saturday to considering what healthy balance looks like for Christian women, along with the hinderances they face in living and leading wholeheartedly. The result? Not surprisingly, this cross-section of Christians first affirmed a timeless reality: for Christians, healthy life balance means aligning with God’s wise priorities as revealed in Scripture. Going deeper, they brought to light that for today’s Boston-area Christian women, God’s priorities have enemies — counterfeit messages that pervade our local culture and lurk in Christian spaces. This is what we heard. 1. Do everything asked, for everyone who asks, without delay, or you've failed. Over a third of the women struggled to set or adjust priorities in ways that ensured inner peace. What’s more, they felt unable or forbidden to deprioritize any people or opportunities, leading to unceasing guilt and disappointment. I expect myself to say yes to every need that is within my gifting. I spend too much time helping others and not doing what God has called me to do. 2. No failure or learning curve allowed for women. A third of the women felt pressure to do everything right the first time, or be judged as failures in their role as Christian leaders. I despise my learning curve, even though I love learning. I feel judged by my behavior, so I want to do more and do it effectively, instead of learning as I go, or even learning and then acting. I feel I need to be in control / all knowledgeable even though I’ve never done this (my ministry) before. 3. Effective leaders don't show weakness, vulnerability, or need for others. Despite some women’s expressed concerns that they lack the time, energy or resources to accomplish what others are asking of them, a number of women echoed false narratives that denied their legitimate needs for others—needs like support, mentoring or even God’s empowerment. Some comments revealed a belief that good leaders are supposed to be a source of unwavering strength for others. To be a strong, independent woman means not allowing for true vulnerability, means ‘sucking it up,’ means always thinking of others first. I need a safe space to not be okay. 4. Women should lead like men to be effective; for women to act like men is distasteful. Experienced women leaders felt pressure to “lead like a man” in order to be effective in certain contexts. But paradoxically, some women reported that if they display qualities more commonly associated with men—being “assertive,” “confrontational” or “aggressive”—these are deemed inappropriate for women. Christian women leaders are navigating this catch-22 to provide authentic leadership. In ministry, I’ve experienced that I had to be or act different than my true self (as a woman) because I had to act as a man (hard, direct) which is not my true self. 5. Busy is the new godly. Many women pointed to a culture of busyness that encourages them to fill all of their time with activity. For some, this is framed as spiritual virtue; i.e., because I am blessed by God, I’m obligated to serve others as much as humanly possible. Having a full schedule is the right way to live… free time or downtime is of no value. Rest and slowing down is selfish. I feel like I need to look pretty, be smart, witty, strong, confident, not overly emotional, helpful, charming, graceful and gracious—all in one! Women of color in leadership need to be more, better, extra than EVERYONE else just to be invited to this table. If I am not articulate, competent, attractive enough, my voice will not be acknowledged; neither will the voice of those who identify with me who will come behind me. 7. Christian women leaders are in competition with each other. A smaller group, citing a shortage of leadership opportunities for women in some places, observed a “scarcity mindset” among women in leadership. They lamented that women may unnecessarily see one another as competitors instead of as important allies. Thanks to the Spirit’s work in them, the women of the Woven Consultation already recognize these messages as errors—severe hindrances to God’s redemptive work in the world. Throughout the Consultation, women heartened each other with practical tips for standing in Christ against these unhealthy tides. But this is not enough. They also need the wider Christian community to join them—to think and act creatively alongside them—so we can all thrive together in our pursuit of Christ’s best for our families, our churches, our community and our city. HOW CAN MEN & WOMEN HELP? • Meditate on Scripture to find biblical wisdom to counteract each of these false narratives. • Expose these distortions in small group discussions, Bible studies and sermons. • Share the habits you practice that help you combat these distortions and help you to lead a balanced life. For example, encourage Sabbath-keeping and the healthy rhythms of a grace-filled life. • Be careful about the behavior that you publicly praise or reward. Make sure to encourage self-care and healthy boundaries just as much as hard work and sacrifice. • Model and encourage gospel-based balance through self-care, rest and healthy boundaries. • Discuss the 7 Twisted Messages with a friend or small group. Is the Lord leading you to confront any distorted messages in your life? • Commit to naming and challenging these distortions as you observe them in your church-community, workplace or family. Annual women’s leadership consultation and monthly cohort groups to share stories, build relationship and to collectively discern ways to take action toward empowering and supporting women, churches and communities. Technical assistance to churches, women‘s networks and organizations. Collaborative research and community engagement on challenging urban justice issues facing Boston’s churches, with a current focus on gender justice, public health, and youth.